You're welcome to enter my OTHER GIVEAWAYS while you're here, and I hope you will. Thanks for stopping by, and hop along now little doggies for a hundred or so more chances to win a great seaworthy book! Thanks for the giveaway :) I haven't really read any mermaid books yet even though I know there's a whole genre out there... this would be a good opportunity to give it a try! I remember reading a Selkie book once years ago that was really amazing. I think it was called Seven Tears Into the Sea. Thank you for the giveaway, and the easy entry! Thanks for making this so easy! =) I'm also pleasantly surprised to see Andersen's faerie tales make your list. @Carmen: Thanks for sharing that book! I'll have to put it on my TBR. My kids are my life, books are my passion, and giveaways are my time-consuming hobby! Thanks so much for participating in this awesome blog hop! 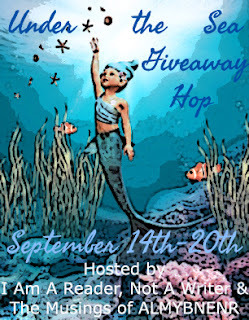 I love mermaid books and if I won I would get a copy of Everblue since it's been on my TBR list since it came out!! wow..i love ur giveaway !! !